Found a GG Metal Sonic WIP in my files so I'm gonna finish it. Ray has been added! I will change the super colours when I can tho. 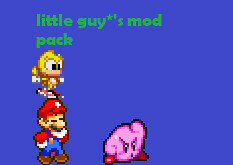 This is a pack I'm working on, currently making Superstar Kirby and 8-bit Metal Sonic. It isn't SMBZ Mario, it's Mario&Luigi Super Star Saga and other Mario&Luigi game sprites.